If fertilizers are so great, why does a grower need fertilizer boosters? That’s a fair question. The answer is that fertilizer boosters (cationic exchange stimulants) work in the plant itself to make more effective use of the added nutrients provided by fertilizers, thus reducing the amount of fertilizer required to achieve optimum yields. Cationic exchange stimulants actually improve the absorption ability of the plant by helping it to more efficiently process nutrients and water, which means the plant’s roots, stalks and leaves are strengthened, promoting higher quality and higher production yields. Because fertilizer boosters like BioWash are inexpensive to apply, they reduce the amount of fertilizers needed while actually promoting improved crop yield. Growers are finding they actually save money by adding good fertilizer boosters like BioWash. For example, a Louisiana tomato farmer reported reducing his fertilizer cost by 80% and yet enjoying his greatest tomato yield ever achieved! 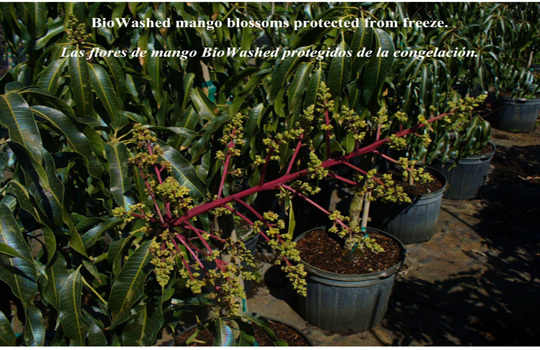 Because BioWash helps increase BRIX (plant sugar), which discourages many insects, he also found that his tomatoes were virtually insect-free without the use of insecticides.